You can accomplish more working together as a team. Each of the girls has her own superpower that makes her formidable. As a team, however, those powers are multiplied and the Powerpuff Girls are unbeatable. Siblings need to look out for one another. Even with their powers, the three sisters are still dependent on one another, and always look out for the other two. Bid sister Blossom especially shows us what love for our siblings really means. Everyone has value. Bubbles and Blossom each have their superpowers. Bubbles can understand foreign languages and communicate with animals; Blossom has that icy and fiery breath. Buttercup is a fighter, plain and simple. She lacks a real superpower of her own, but she’s still an equal member of the team. The right chemistry makes all the difference. When Professor Utonium was creating the Powerpuff Girls out of” sugar and spice, and everything nice”, Mojo Jojo bumped some Chemical X into the mix. This accounts for the unique nature of the girls. Great teachers have a great influence on theirs students’ lives. Ms. Keane is a caring and loving figure in the lives of her students. Her influence is a big reason why Blossom, Bubbles and Buttercup are such caring members of their community. You can make a difference in your community. The Powerpuff Girls show us that anyone can help their neighbors and make their community a better place to live. Even going so far as to help the mayor do his job, these girls have great civic pride and make sure their hometown stays great, and crime-free. Money can’t buy happiness. The Powerpuff Girls have a nemesis named Princess Morbucks, whose family is loaded. She tries to defeat the girls with all manner of weaponry paid for by her rich dad, because they wouldn’t let her join the PPG’s, but to no avail. It’s a bad idea to monkey with super crime-fighters. Just ask Mojo Jojo, that big-brained simian with bad intent. He’s the former lab assistant of Professor Utonium who nowadays is bent on the destruction of our Powerpuff Girls. Behind every great man there really is a great woman. Let’s face it, without Sara Bellum as his assistant, the Mayor would be as lost as last year’s Easter eggs. Ms. Bellum keeps him on track, or at least as much as anyone can keep the Mayor on track. There’s no power stronger than sisterly love. 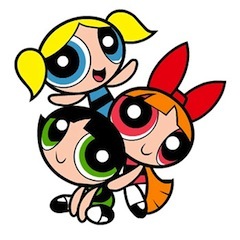 Blossom, Bubbles and Buttercup stick together like glue, and woe unto anyone who tries to come between them, or confront them. Their love for each other and their home is what keeps them fighting evil, and cavities.